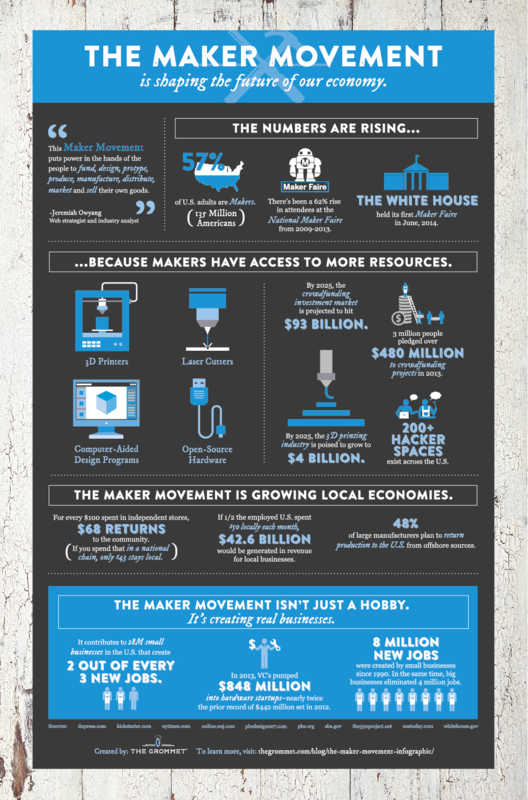 Kijk, dit is een mooie bron van informatie over de impact van de maker movement op de (Amerikaanse) economie. If you’re a Maker or aspiring to become one: There’s never been a better time. Now you can turn your idea into a reality with an abundance of resources at your fingertips. If you’re a Retailer searching for new, innovative products: Gone are the days where catalogs and trade shows are the only way to find new products. Platforms like The Grommet are making it easier for you by curating the best of the best. You can learn the stories behind products and know each has been vetted and validated before you choose to put them on your store shelves. If you’re a consumer who enjoys learning about new products and trends: Pay attention to the ever-evolving Maker Movement. Support and express your personal values by shopping local and giving back to your economy. Our goal is that within five years, 10% of all products flowing through U.S. retail will be originating from independent small-scale Makers. As you can see, these products are turning into real businesses and your support will help them succeed.